In my last column, I laid out my case against the perma-bears and other merchants of gloom who are perennially calling for a bear market in stocks and a bull market in gold. However, I also underscored that gold is an important part of any serious investor's portfolio. 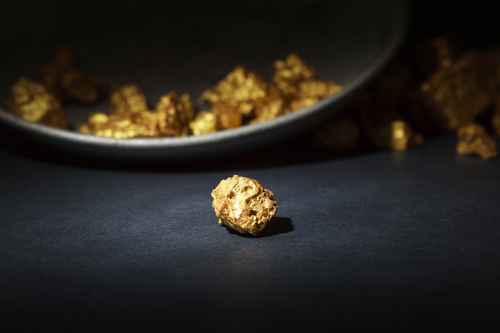 True, gold doesn't accrue interest, generate earnings, pay dividends or provide rental income. But it has other advantages. It is tangible, rare and coveted worldwide. As an investment asset, it correlates with almost nothing else (aside from silver and platinum). That gives it tremendous diversification value. In the past, gold has often lagged the performance of other types of assets. But as the boilerplate on every prospectus warns us, past performance is no guarantee of future results. "It's enormous, enormous! That's more than some OPEC countries!" The Bakken Shale... The Marcellus Formation... Eagle Ford... These huge oil and gas deposits are helping to make America the world's #1 energy producer. But now there's a new find... One larger than all three of those, combined. And one man's invention is going to help hundreds of people get very rich off of this development. Find out how right here. In the past, the federal budget deficit was not as large as the national economy (over $17 trillion). And U.S. unfunded liabilities weren't $115.5 trillion. That's equal to $987,500 per taxpayer. Also worth noting, these figures don't include the rising cost of Obamacare. Last week it was big news that Jonathan Gruber, one of the primary architects of the Affordable Care Act, said the law was deliberately deceptive. He cited the stupidity of voters. Yet most Americans aren't dumb. A majority opposed the bill when Obama signed it into law - and an even bigger majority opposes it today. According to PolitiFact, Obama said, "If you like your plan, you can keep your plan," 31 times. Yes, most voters believed him. But that wasn't stupidity. That was trust. His poll numbers say that trust - both in government and him personally - is now greatly diminished. Of course, more than a few Americans raised an eyebrow at Obama's claim that forcing insurance companies to cover people with pre-existing conditions would drive premiums down and that Uncle Sam covering 30 million Americans without health insurance would reduce the budget deficit. That simply doesn't add up... and never sounded like it would. In short, the fiscal recklessness of the federal government - not to mention some of the larger states - threatens our long-term financial security. This is why I often return to my theme of "Investing in a Bipolar World." On the plus side, we have entrepreneurs, business owners and dedicated workers meeting our demand for every type of good and service imaginable. (Not to mention many we couldn't have imagined.) The private sector is an astonishing engine of productivity, efficiency and innovation. Moreover, as prosperity grows both overseas and at home - U.S. household net worth is at an all-time high - so does consumers' ability to buy gold coins, gold rings and gold watches. There is a long-term bullish case for gold based on rising affluence. On the minus side, we have a federal government that spends money like it's printing it in the basement. Maybe that's because it is printing it in the basement. And perhaps that's another reason you should own some gold. The question is how much. I often travel to conferences where some attendees tell me they have 50%... 60%... 75% of their total assets in gold. That's a big bet on Armageddon, one I'm not willing to take. However, you should take out some insurance. I call that insurance gold. P.S. If you're looking for a precious metals dealer that is competitive, trustworthy and reliable, I recommend Asset Strategies International. The firm buys and sells precious metal (gold, silver, platinum and palladium) in coins, bars and certificates. It also deals in numismatics and more than 100 different foreign currencies. Three of its executives - including CEO and Oxford Club Pillar One Advisor Michael Checkhan - even created the Perth Mint Certificate Program for the Australian Mint. For more information, call Michael at 800.831.0007. Say what you will about Obamacare, there's no question that the massive healthcare law has opened huge opportunities for investors. And they've cashed in. Check out the chart below of five major healthcare sector ETFs: iShares US Healthcare Providers (NYSE: IHF); Health Care Select Sector SPDR ETF (NYSE: XLV); Vanguard Health Care ETF (NYSE: VHT); iShares US Pharmaceuticals (NYSE: IHE) and iShares US Medical Devices (NYSE: IHI). They're all up double digits this year. Obamacare is not the only reason. But there's no doubt that with the millions of new insured patients gaining healthcare services and filling prescriptions, it's a big one. Marc's Lightning Trend Trader service, meanwhile, has eight open positions at the moment (not including options), and all eight are in the money. His subscribers have taken gains as high as 60% this year. Recently, Marc told his Lightning Trend Trader subscribers about a new way to play the trend. "Steris (NYSE: STE) makes products that prevent infection in hospitals," he said. He noted that Obamacare requires hospitals to reduce their infection rates, "which should fuel demand for Steris' products for years to come." Yet even as it's benefiting from the big-government policies reflected within the Affordable Care Act, Steris is also seeking to lighten its tax load. The company is in the process of acquiring a British competitor, in part so it can take advantage of lower U.K. corporate tax rates by moving its headquarters there. "Since the U.S. government has already stated that it is trying to fight these kinds of deals, I think the risk of the deal not going through is already reflected in the stock price," Marc said. "At this point, I believe there is only upside as far as that angle is concerned." Since adding it less than a month ago, Steris has surged 19%. And Marc continues to see upside: "Steris is a real business with growing profits, cash flow and cheap valuation."